So thrilled to hear that The Star Inn at Harome, one of the most beautiful eating establishments in North Yorkshire, has once more been awarded a Michelin star. Chef Andrew Pern and his team must be beaming with satisfaction. This beautiful thatched building is crying out once again to be visited, whether it is just for a pint of beer, or a full meal with exquisite wines. For a special treat, stay in one of their superb cosy rooms, eat in the restaurant and have a Michelin star breakfast delivered the next morning. I’m saving up for that one! What about The Pipe and Glass? 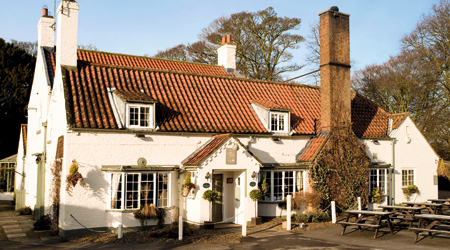 And, closer to home, in East Yorkshire, The Pipe and Glass Inn at South Dalton (just outside the lovely ancient market town of Beverley), has received it’s Michelin star yet again, which is so well deserved. The Pipe and Glass Inn has also been named the National Dining Pub of the Year by the 2015 Good Pub Guide. Chef James Mackenzie, wife Kate and all the industrious and creative team at South Dalton deserve a big cheer for keeping the standards so high. James and Kate are adding on more bedrooms, so for a very special occasion, you can stay the night in one of their beautiful rooms after having had a Michelin star meal the night before. Being honest, these fabulous eating establishments hold a special place in my heart. Relaxing from the moment you walk inside, given the choice of such amazing food whether it be a ‘pub’ meal, a three course special or a five or six course taster menu, and being looked after by such friendly and knowledgeable staff, you know that you are in a very special place. Now that my appetite has returned, I’m going to make sure that Erik and myself actually take days out again, and these two will be first on my list. But don’t forget the Cookbooks. 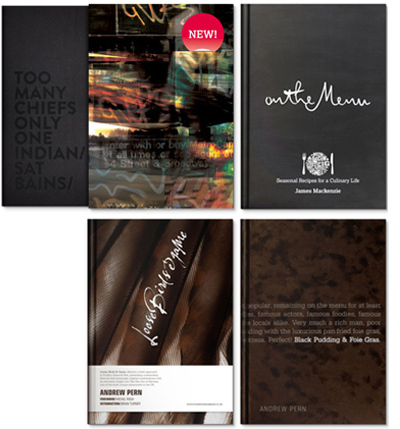 Also, as some of you older readers will know, my Designer son, Anthony, designed two amazing cookbooks for Andrew Pern, one for James Mackenzie, and one for Sat Bains, all of which won Gourmand Cookbook awards in recent years. All these cookbooks are so different. Black Pudding & Foie Gras (Andrew Pern) is not only a brilliant cookbook and the story of Andrew’s life and love of cooking, but is a beautiful book to look at, and I defy you not to stroke the soft, almost fluffy front cover. Now I am back to eating and cooking (hurrah), I am getting more adventurous again, and lucky for me, I have a special copy of each of these stunning books. The other day I opened up Loose Birds & Game (Andrew Pern), and remembered my comment when Anthony said they wanted to do a book about Game. “No blood and guts” is in this beautiful book, but it gives you an understanding of using Game, with stunning pictures of finished recipes that really make your mouth water. On the Menu (James Mackenzie) is a very different book to look at. With its crisp black and white cover, very amusing titles and, once again, superb recipes and pictures, this book is a joy to have in your kitchen. And I have to finish off with Too Many Chiefs Only One Indian (Sat Bains). This is an enormous book, in every sense of the world. It has to be, because Sat Bains is a larger than life, 2 Michelin star chef. It is a work of art for experimental chefs, amateur and professional. So different to any other cookbook, but incredible to read. All the cookbooks are available to look at and buy from Face Publications, so click here to have a good look. Those words, “All Clear”, mean a lot.